This is how he works: a torch in hand, the flame passing over metal in rhythmic waves as he peers through goggles at the elemental fusion of steel on silver alloy on steel. The creator of YiPsan Bicycles, Renold Yip, Hong Kong-born and now Colorado-based, is in his garage in Fort Collins crafting a bike with his hands. At this point, he’s already dragged the teeth of a hatchet across steel tubes, filed down their edges into curved angles, and has placed the bottom bracket, the top, bottom, head and seat tubes into a frame jig (basically a metal block with adjustable clamps). The tubes are attached by steel, casted lugs. He’s coated the joints with flux, which looks like a white putty, to chemically clean the metal, and he’s tacked each connection in place and has brought the frame’s front triangle to an alignment anchor. He’s already taken readings of each tube, and after seeing that they’re all within 3/1,000 of an inch of where they should be, has decided they’re good to go. And now Yip is brazing the joints. A thin coil of silver alloy is wrapped around his arm, which he’s feeding through his fingers and then along the edges of the lug castings that envelop the frame tubes. The torch heats the alloy until it’s molten, and in turn the alloy fills the space between the lug and the steel, fusing them together. This is the physical expression of what began simply as a conversation with another cyclist seeking a handcrafted machine. A custom bike is tailor fit to body dimensions, but it’s not just that, says Yip. It’s also fit for purpose. “You need the body dimensions, but equally important, then are you going to ride the Tour de France as an amateur? We need to fit that application. Are you going to ride cyclocross in Boulder? That’s another application. We also need to match the rider’s abilities.” Yip tells his customers five months after they agree on a CAD design of the bike. Then he orders the raw materials, and after months of labor, a bike that is birthed into the world. Generally, the radio website, B100.net, projects news from Hong Kong into the garage as he works, but today it’s classical piano, because, he decides considerately, I wouldn’t like listening to news in a language I can’t decipher. So instead we discuss world events in our common tongue. As he brazes the frame, he tells me of his native home: “Hong Kong is going through some changes. They just celebrated sixteen years since the handover from the British, but people are starting to see some changes they don’t like. ‘Redifying,’ they call it. More communist-like.” He used to listen to Chinese radio stations, but in the new political climate, they can no longer acquire licenses to broadcast what the rulers consider anti-government messages, so he listens to stations that have moved online. “Less rules,” he explains simply. This, it should be noted, is also how he works: alternating discussion topics between the alchemical and philosophical implications of craftsmanship and the simple but wondrous joys of bicycles, to “real-world” issues—politics, culture, society, class, justice—all the while wielding a torch or a hacksaw, or perhaps computing measurements to within fractions of millimeters. That Yip invokes the ruminations of “old-timers” is no accident. Yip builds lugged bikes exclusively (lugs being the socket-like sleeves that form the joints); the same way bicycles have been crafted since back in the late 1800s. He keeps things traditional, “old-school,” as he says, with only hand tools and time to aid in the construction process. “It’s definitely not the most efficient,” he allows. “If you gave me a thousand orders now I would be in trouble.” It’s true, none of his methods can be considered “efficient.” But this is about craft, not speed, quality and not quantity—the opposite of mass production in both spirit and invention. Yip makes approximately 15 bikes a year. “I don’t believe in having a machine to cut the tubes and form the angles. If that’s the case, why even do it? Just have a robot do it.” And anyways, every person, and therefore every bike, is different. There’d be no point to set up a machine in a certain way because he’d have to change it all the time. 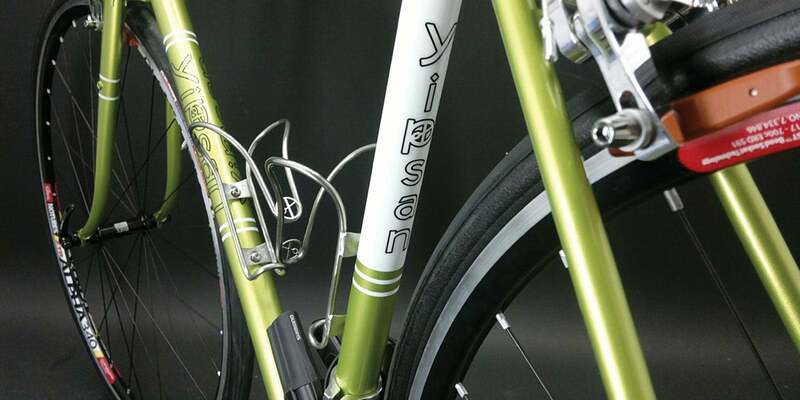 With the front lug now fused with the head tube, Yip rotates the frame on the bike stand and brings the torch to the bottom bracket lug to repeat the brazing process. As the area heats up, the flux first turns clear and oozes before crystalizing like an emerald. The metal tubes glow red, and the molten silver runs. He rotates the frame as he brazes each crease so that the silver is subjected to gravity, filling in the space between tube and lug until each point of connection is fused. The tighter angles require more patience. It takes longer for the molten silver to fill them in, so the passing of the torch must be gentle, careful not to overheat and burn, instead to let the heat spread, drawing the silver into the tight spaces. It could be said that Renold Yip was destined to work on two-wheeled machines since birth. His father, a longtime motorcycle enthusiast, named him “Renold,” after the high-quality motorcycle chain he ran on his bikes back when they lived in Hong Kong, the home Yip eventually left at the age of 32. He went on to the UK to earn a degree in Manufacturing Engineering, which helps him to this day in his chosen profession, and then immigrated to the U.S. in 2002. At that point, he became a journeyman apprentice of sorts, living in various U.S. cities and working in bike shops with “masters” of different skillsets necessary to becoming a bike builder. For nine months he ran a neighborhood bike repair shop out of his home in Snoqualmie, Washington. From 2003-2006, he worked at All American Bicycles in Damascus, Maryland and attended the United Bicycle Institute to learn frame building. When he and his wife settled in Colorado he worked at Lee’s Cyclery, learning the ins and outs of bike fitting, a crucial step in custom design bike building, before launching YiPsan Bicycles. Now he builds his award-winning bikes (“People’s Choice” and “Best City Bike” from the North American Handmade Bicycle Show) out of his garage. After the front triangle is done, Yip cleans off the crystalized flux and returns the triangle to the frame jig where he builds the back end. Only after the frame and forks are completed will he begin building racks. The racks, to a large degree, are where his artistic side comes out. He uses a manual tube bender to place curves in the metal, complimenting function with fashion. One customer, for example, wanted her bike to take inspiration from sunflowers, so he built a steel and wood flower-petal mosaic into the bike’s basket rack. Finally, a custom paint job finishes the product. Sounding somewhat disappointed, or perhaps just amused, Yip says, “People will never notice a bike made by me without paint. People notice a bike because of paint, and then they’ll say, ‘Oh, so who made this?’” Only then do people notice all the subtle gestures that make his handcrafted bikes unique, and frankly, superior to mass-produced bicycles that fill bike shops. Paint, it turns out, is very personal. It’s the first impression. From Issue 26. Buy it here.